Sheds have become much more than just boring garden storage. There are even competitions to find the best sheds in the UK now, so people are embracing the idea of creating something really special at the bottom of the garden. I could show you a picture of my shed at this point, but you wouldn’t be impressed. It really is a boring, relatively dilapidated brown storage room. But wouldn’t it be cool if it was much more than that? There are lots of ways to decorate your shed. There are lots of different uses for garden buildings too, and they’re much more affordable than you think, particularly if you build your own. I’ve been hunting Pinterest again for inspiration and thought it might be fun to showcase some of my favourite finds. 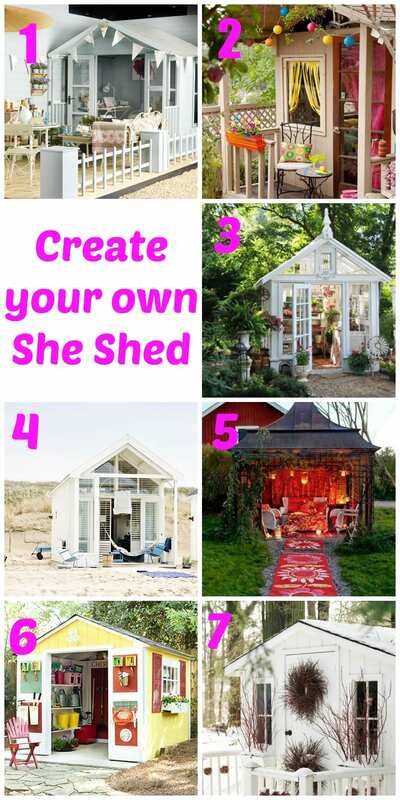 Move over Man Cave, it’s time for the She Shed! If you’re looking for a new shed to turn into your she shed project, why not take a look at the extensive range at Quick Garden. Sheds are always my domain and filled with flowers, bunting and Union Jacks. I love to make them pretty rather than just being for all the boring storage of tools etc. I want a writing she shed, just need the room in the garden! ME !Me!Me! I’ve been dying for one. Somewhere to hang in the winter months to get out of the house. Guess I will turn my husbands Man Cave in the basement into my She shed. Ahhh…. I have great dreams for a creative shed space when we finally get around to having our own home.